The Dolphin Treasure is a 20 line slots game, so it has far fewer pay-lines than the new 'Reel Power' games by Aristocrat that give you 243 lines. That said, the game also has some very big maximum wins on each pay-line, so you can still win big. Dive with dolphins into the ocean’s depths in search of astounding treasures in Aristocrat’s title Dolphin Treasure. Tranquil underwater sounds and a calming atmosphere will help you relax and enjoy this video slot. Beautiful design with sea creatures performing fun animations each time they’re part of a winning combination contribute to your playing experience. This 5-reel, 3-row slot has 20 paylines across which you can place your wager. After you have chosen the number of lines you wish to play, you can set the coin size from $0.01 to $2.50 by pressing the plus and minus buttons. Your total bet will amount to the minimal $0.20 and up to the maximal $50.00. The only thing left for you to do is press Spin or activate Autoplay and make the reels spin without stopping for up to 25 times. You will cash in each time matching icons land on adjacent reels from left to right. In this slot, some of the symbols pay out when 2 appear on the reels. As the theme implies, various sea animals, including the dolphin, occupy the reels. The Turtle and the Seahorse will award you with 750 coins for landing 5 of a kind. The Starfish offers a 400 coins prize. And the Octopus and the Angelfish will present you with 250 coins for 5 matching symbols. And though these animals represent high-paying icons, the Golden Sunset stands for Wild, replacing all symbols but Scatter and awarding the most significant sum of 9,000 coins. When 1 or more Wilds are part of a winning combination that win is doubled. Whenever Wild is activated, the dolphin jumps out of the water. On the lower part of the paytable you will find playing card symbols, 9 through Ace. Icons 9 through King will award 100 coins for 5 appearing simultaneously. Only the Ace will pay out 125 coins for 5 on a payline. Scatter is depicted as a Treasure Chest which will provide you with wins up to 400 coins if you land 5 of them anywhere on the reels. Scatter wins will be multiplied by your total bet. Furthermore, 3, 4 or 5 Scatters activate 15 Free Games during which a 3x Multiplier is present. Another way to enlarge winnings is to use the Gamble option, which will be at your disposal each time you land a win. Those who are willing to take the risk can use this feature and end up with doubled or quadrupled prizes. If you guess the colour of the next card in the stack, your win will be doubled. If you choose the card’s suit correctly, a 4x multiplier awaits you. 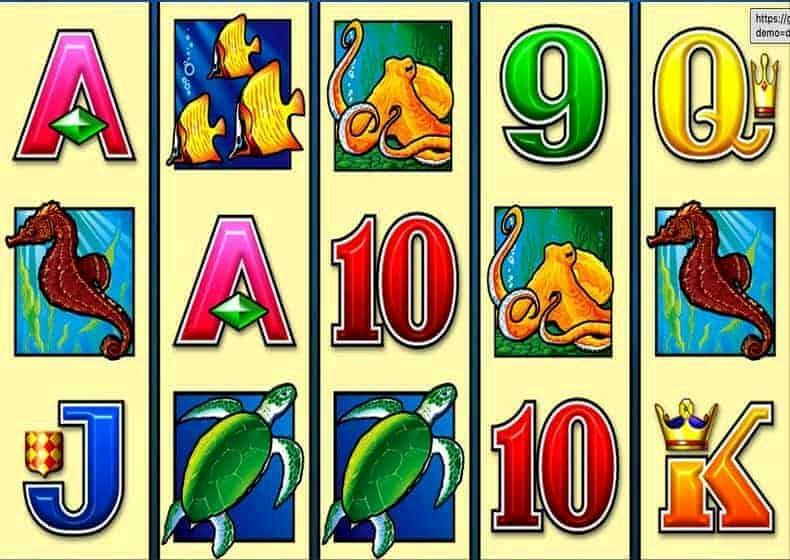 The fact that this slot offers 2-of-a-kind payouts for some symbols ensures constant wins for the player and this frequency of smaller wins definitely adds excitement to gameplay. Boasting simple gameplay with standard, yet profitable features, Dolphin Treasure is a somewhat classical game definitely worth trying out. 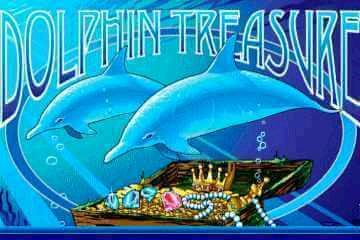 The real money Dolphin Treasure slots is not found in many casinos in the USA, but you will find it, if you search hard enough. I have seen Dolphin Treasure in quite a few off-strip casinos, especially the ones where locals like to play. If you manage to hit the bonus, you get a nice 15 free spins feature. There is nothing particularly notable about the free spins, apart from the fact that all wins are X3. So, effectively, you are getting 45 free spins. Also, you can re-trigger as many times as you are able to, so you can get some really massive wins, if you are lucky. So, we have test out hundreds of real money casinos and compiled a list of the best casinos, based on game quality and selection, security and payouts, please visit our real money casinos page to see the list.